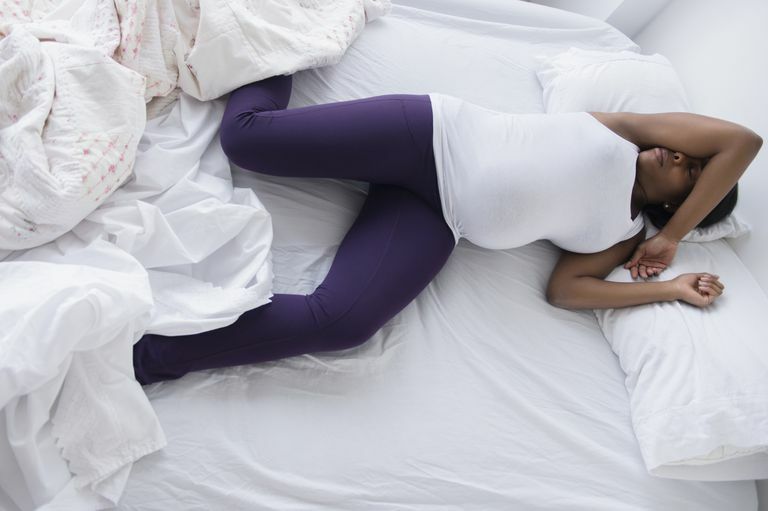 Whether you are in your first, second, or third trimester, or at the beginnings of labor, pregnancy can have profound effects on your ability to sleep. Hormone changes may alter the nature of a pregnant woman’s sleep. Preexisting sleep difficulties may worsen, and new ones may show up with each phase of pregnancy, introducing new challenges. Review how to sleep best in pregnancy, including the role of hormones, possible solutions to sleep problems, and the best positions to relieve back pain and insomnia. The wide-ranging effects of pregnancy on sleep cannot be understated: changes occur in quality, quantity, and the very nature of sleep. For those who have an underlying sleep disorder, these conditions may worsen. Moreover, there are many sleep problems that first appear in life during pregnancy. Although these issues may start soon after conception, they typically increase in frequency and duration as the pregnancy progresses. Nearly all women notice increased nighttime awakenings, especially during the third trimester. There can be physical discomfort, psychological adjustments, and hormone changes—all of which can impact sleep and result in excessive daytime sleepiness and fatigue. As any pregnant woman can attest, there are dramatic hormonal changes that accompany pregnancy. These changes affect many aspects of the body and brain, including mood, physical appearance, and metabolism. The hormone changes also affect the pattern of sleep, or sleep architecture. Progesterone relaxes smooth muscle and may contribute to frequent urination, heartburn, and nasal congestion—all of which may be disruptive to sleep. It also decreases wakefulness during the night, and reduces the amount of rapid eye movement (REM) sleep, the state of sleep characterized by vivid dream imagery. In addition, it reduces the amount of time it takes to fall asleep. Another important hormone in pregnancy, estrogen can also affect sleep if it makes blood vessels larger through a process called vasodilation. This may lead to swelling or edema in the feet and legs, and may also increase congestion of the nose and disrupt breathing during sleep. In addition, like progesterone, estrogen can decrease the amount of REM sleep. Other hormones may also change during pregnancy, with varying effects. Studies have shown that melatonin levels are higher during pregnancy, and increased levels of prolactin in the body may lead to more slow-wave sleep. During the night, higher levels of oxytocin may cause contractions that disrupt sleep. This increase in oxytocin may also lead to a higher incidence of labor and delivery during the night. The patterns of sleep change dramatically during pregnancy. Studies with polysomnography have shown how the characteristics of sleep change. One of the general themes is that the amount of time spent asleep while in bed, or sleep efficiency, gradually decreases. This is mostly due to an increased number of awakenings during the night. First Trimester (First 12 weeks): Around week 10 of pregnancy, the total sleep time increases with a longer sleep period at night and frequent daytime naps. Sleep becomes less efficient with frequent awakenings, and the amount of deep or slow-wave sleep decreases. Many women complain of poor sleep quality. Second Trimester (Weeks 13 to 28): Sleep tends to improve with better sleep efficiency and less time spent awake after going to sleep at night. By the end of the second trimester, however, the number of awakenings during the night again increases. Third Trimester (Weeks 29 to term): Women in their final trimester of pregnancy experience more nighttime awakenings and spend more time awake at night. They also nap more frequently during the day, so sleep efficiency is again reduced. In addition, sleep is lighter with more frequent stage 1 or 2 sleep. The first trimester of pregnancy may result in fatigue and excessive daytime sleepiness. Studies have shown that women who are younger or who have low levels of iron before pregnancy have increased fatigue. Up to 37.5% of pregnant women at 6 to 7 weeks complain of sleepiness. This is thought to relate to the increased levels of the hormone progesterone, and the resulting fragmentation of sleep. A variety of physical changes and symptoms may also undermine sleep, including: nausea and vomiting (morning sickness), increased urinary frequency, back pain, breast tenderness, increased appetite, and anxiety. Anxiety can be especially problematic if the pregnancy was unplanned or if there is a lack of social support. This may result in insomnia. The good news is that sleep typically improves during the second trimester of pregnancy. Nausea and urinary frequency decrease as energy levels and sleepiness improve. Towards the end of this period, women may experience irregular contractions (called Braxton-Hicks contractions) or stomach pain that may disrupt sleep. In addition, movements of the fetus, heartburn, and snoring due to nasal congestion may affect sleep. Many women have increased energy and improved mood during this time. All of these problems may lead to a loss of sleep, and daytime sleepiness may affect 65% of women. It may be difficult to find a comfortable sleeping position, and you may need to use pillows to provide more lumbar support to reduce back pain. In addition, the incidence of sleep apnea and restless legs syndrome increases. More women will experience nocturnal heartburn or gastro-esophageal reflux disease (GERD). Some women like to use a wedge pillow to reduce these symptoms. It is also during this phase of pregnancy that preeclampsia may occur, which has an impact on the timing of sleep or circadian rhythm. Not surprisingly, labor and delivery can also have a negative impact on sleep. Due to the elevation of oxytocin that peaks during the night, many women will experience forceful contractions that begin in the night. The accompanying pain and anxiety associated with contractions while laboring may adversely affect sleep, and the medications used during this period may also impact sleep. Unfortunately, many pregnant women are unable to sleep while laboring, even with the use of sleep aids. Sleep can profoundly change during the major trimesters of pregnancy. Hormones affect the structure of sleep, and physical ailments that accompany the pregnant state may lead to disrupted sleep. Fortunately, many of the difficulties related to poor sleep during pregnancy will quickly resolve once the baby is delivered. If you find that you are struggling to sleep during pregnancy, speak with your obstetrician. In some cases, a referral to a board-certified sleep physician may be helpful to discuss treatment of sleep disorders such as sleep apnea, insomnia, and restless legs syndrome. If you are struggling, reach out to get the help you need to improve your sleep. Kryger, MH et al. "Principles and Practice of Sleep Medicine." ExpertConsult, 5th edition, 2011, pp. 1572-1576.